Do you know what prompted me to become a Bark Busters trainer? Years ago, I was frustrated with my own dog’s behavior…jumping up, barking, etc. So my wife and I called Bark Busters to help. Yep, we were clients first. And the natural methods made so much sense, and were so effective, that I decided to become a Bark Busters trainer myself. That was 8 years ago. Fast forward to today, I’ve trained hundreds of dogs and their owners. It is challenging at times, but that is far outweighed by the results- happy dogs and happy families. I grew up in Montgomery County, Maryland, and have always loved animals, and have worked with them in various capacities. I have worked with dogs at vet hospitals and the Montgomery County Humane Society. When I’m not working, I enjoy playing guitar, working on my car, and of course, spending time with my wife, daughters, cat, and dog, Radar (named, of course, after Radar O’Reilly from M*A*S*H). Have problems with accidents in the house? Have "trouble" as his middle name? Hears the word "no" more than yes? Bark uncontrollably and jumping up? Display any signs of aggression? Experience sibling rivalry with the puppy? Walking you while pulling you? If you can answer "yes" to any of the questions above, Bark Busters Northern Montgomery County can help! 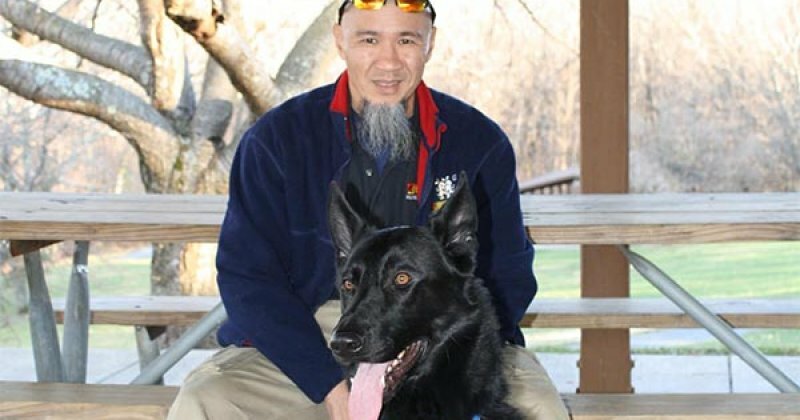 I have been a professional dog trainer for more than four years and have successfully trained hundreds of dogs throughout Northern Montgomery County, (Also in Howard, and Carroll Counties) including Clarksburg, Damascus, Gaithersburg, Lisbon, Montgomery Village, Mount Airy, and Woodbine and Mount Airy. By using the Bark Busters home dog training method which has succeeded where other methods have failed. Why? Your dog can't speak English and you can't speak dog, so miscommunication is bound to occur. We teach you to speak to your dog in a language he understands. Simple. Effective. Fun. We come to you, because your home, yard and neighborhood are where most of the problem behaviors occur. Puppy classes often rely on a "one-size fits all" approach which doesn't take into account your dog's individuality. First, we develop a personalized dog behavior modification plan based on your goals and the dog's unique personality and temperament. We will address ANY behavioral issues your dog may display including aggression, anxiety, barking, chewing, digging, separation anxiety, sibling rivalry, and more. We start out indoors but will progress outside where you may have issues with socialization with other dogs or leash pulling. The first dog training sesion will last approximately 2 - 3 hours. Then we give you homework. If you reinforce our techniques 10 - 15 minutes/day, you'll be rewarded with a well-behaved dog! Trust, clear communication and understanding will permanently change your dog's behavior versus short-term treat training or force. Our methods are based on positive reinforcement - no shock, prong or choke collars. We don't use harsh techniques or bribe with food to extort good behavior. You will learn more in our first lesson than a "class" environment that may last six weeks! Don't yell, bribe with treats, or put up with behavior issues when you can learn to clearly communicate with your dog after one meeting with Bark Busters. Dogs don't understand English any better than Greek! You don't realize that as a dog owner, you often give them mixed signals and jumbled commands. You have to learn your dog's language versus the other way around. Using body language and voice tones, we will teach you to communicate with your dog in a language he understands. The result? He will learn to trust you, listen to you and feel less stressed! Many of the veterinary clinics throughout Clarksburg, Gaithersburg, Damascus, Mount Airy and Montgomery Village recommend Bark Busters because they know our methods work and are longer lasting and healthier for the dog than other training methods. Your dog wants to please you - he just doesn't know how. Too many dogs are re-homed or euthanized because they are misunderstood. There is no dog behavior we can't change, so you're no longer frustrated with your dog. In fact, I became a Bark Busters trainer when I was looking for a method to train my own dogs. It works. We have a 100% guarantee 'Life of the Dog' support. And it will establish a life-long bond with your dog that's based on clear communication. If your dog could talk, he would tell you to call Bark Busters in Northern Montgomery County, Maryland today.